Seemiller, C. (2013). 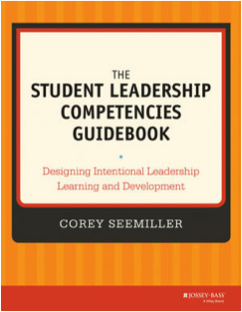 The student leadership competencies guidebook. San Francisco: Jossey-Bass. Seemiller, C. (2017). New Directions in Student Leadership: No. 156. 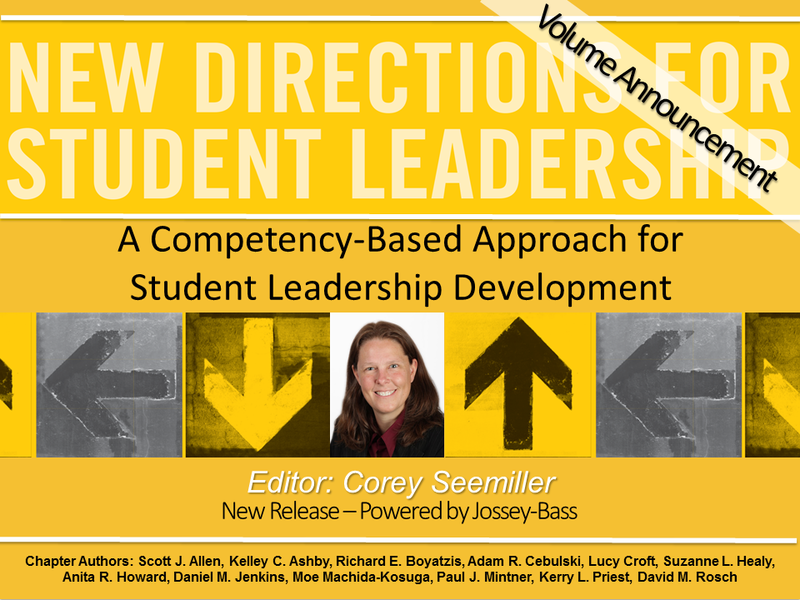 A competency-based approach for student leadership development. San Francisco: Jossey-Bass. Watch the video promo here! Rosch, D. M. & Seemiller, C. (2018). A psychometric analysis of the Student Leadership Competencies Inventory. Journal of Leadership Education, 17(4), 146-168. Seemiller, C. (2018). A competency-based model for youth leadership development. Journal of Leadership Education, 17(1), 56-72. Seemiller, C. (2018). Enhancing leadership competencies for career readiness. In K. K. Smith, G. S. Rooney, & G. Spencer (Eds. ), New Directions for Student Leadership: No. 157. Leadership development for career readiness in university settings. San Francisco: Jossey-Bass. Seemiller, C. (2017). Developing leadership competencies. In C. Seemiller (Ed. ), New Directions in Student Leadership: No. 156. A competency-based approach for student leadership development. San Francisco: Jossey-Bass. Seemiller, C. (2017). Using leadership competencies to develop talents into strengths. In C. Seemiller (Ed. ), New Directions in Student Leadership: No. 156. A competency-based approach for student leadership development. San Francisco: Jossey-Bass. Seemiller, C. (2016). Complementary learning objectives: The common competencies of leadership and service-learning. In W. Wagner and J. Pigza (Eds. ), New Directions in Student Leadership: No. 150. Leadership development through service-learning. San Francisco: Jossey-Bass. Seemiller, C. (2016). Evaluating student leadership competency development. In D. Roberts and K. Bailey (Eds. ), New Directions in Student Leadership: No. 151. Assessing student leadership. San Francisco: Jossey-Bass. Seemiller, C. (2016). Leadership competency development: A higher education responsibility. In K. Guthrie and L. Osteen (Eds. ), New Directions for Higher Education: No: 174. Reclaiming higher education’s purpose in leadership development. San Francisco: Jossey-Bass. Seemiller, C. & Murray, T. (2013). The common language of leadership. Journal of Leadership Studies, 7(1), 33-45. Seemiller, C. (2013). A competency based approach to leadership development. Concepts & Connections, 20(1). Seemiller, C. (2013). Becoming a competency-based organization. Best Practices & Research Edition, NASPA SLPKC, pp. 14-15. Seemiller, C. & Murray, T. (2009). Leadership by design: Creating and measuring leadership competencies. Interchange, 37(2), pp. 5-8. Seemiller, C. (2017). Student Leadership Competencies implementation handbook. Seemiller, C. (2015). Assessing student engagement. Dallas: OrgSync, Inc.